1 Ataturk University Oltu Vocational School, 25800 Oltu, Erzurum-Turkey. 2 Ataturk University Agricultural Faculty Department of Horticulture, 25240 Erzurum-Turkey. 3 Ataturk University Agricultural Faculty Department of Food Science 25240 Erzurum-Turkey. 4 Ataturk University Agricultural Faculty Department of Field Crops, 25240 Erzurum-Turkey. Key terms: DPPH, Sage, Salvia, total phenolic content. The human body produces reactive oxygen species (ROS), such as superoxide anion radical, hydroxyl radical and hydrogen peroxide, by many enzymatic systems through oxygen consumption. In small amounts, these ROS can be beneficial as signal transducers (1) and growth regulators (2). However, during oxidative stress, large amounts of these ROS can be produced and may be dangerous because of their ability to attack numerous molecules, including proteins and lipids (3). In fact, it has been reported that ROS largely contribute to cellular aging (4), mutagenesis (5), and coronary heart disease (6) through several ways, including membrane destabilisation (7), DNA breakage (5) and generally by oxidising low-density lipoproteins (LDL). The cell can reduce the impact of ROS either by an endogenous system implicating enzymes such as catalase and superoxide dismutase or by an exogenous system using antioxidants, vitamin C and a-tocopherol (8). In recent years, plant extracts have appeared on the market as antioxidants for food industry use. The antioxidant capacity of some of these compounds has been proved to be comparable to, and sometimes higher than, that of synthetic antioxidants (9,10). In particular, the Lamiaceae family includes a large number of plants that are well known for their antioxidant properties. Among these, sage has been widely used and most of its antioxidant components have been identified. It has been established that the antioxidant effects of sage are mainly due to phenolic compounds (10, 11, 12). The genus Salvia (Lamiaceae) includes nearly 900 species spread throughout the world. This genus is represented in Turkey by 89 species and, altogether, 94 taxa, 45 of which are endemic in Turkey. The rate of endemism in the genus Salvia in Turkey is ca. 45% (13). Many Salvia species are used as herbal tea and for food flavouring, as well as in cosmetics, perfumery and the pharmaceutical industries throughout world (14). The aim of the present study was to examine the in vitro antioxidant activities of the methanolic extracts of eight Salvia species. A literature survey did not reveal any reference to any previous work comparing the antioxidant activities of these species. Most of the studies in the literature are focused on Salvia officinalis (garden sage), since it is used as a reference plant because of its well-known and widely documented antioxidant properties. Therefore, we think that the results presented here will provide new information on the species studied. All the chemicals used were purchased from Sigma & Aldrich company and were of analytical grade. The plant material (aerial parts) was collected in mid-July of 2007 from the Erzurum Region in eastern Turkey. All plant materials were authenticated by Dr. Meryem Sengul of the Department of Biology of Ataturk University. The voucher specimens have been deposited at the Herbarium of the Department of Field Crops of the Agricultural Faculty of Ataturk University, Erzurum-Turkey. The air-dried and finely ground samples (weighing about 100 g) were extracted in a Soxhlet with methanol (MeOH) at 60°C for 6 h. The samples were then lyophilized and kept in the dark at +4 °C until tested. Total phenolic constituents of Salvia extracts were performed employing methods from the literature involving Folin-Ciocalteu reagent and used gallic acid as standard (15). The hydrogen atom or electron donation abilities of the corresponding extracts and some pure compounds were measured from the bleaching of the purple-colored methanol solution of DPPH. This spectrophotometer assay uses the stable radical, 2,2'-diphenylpicrylhydrazyl (DPPH-), as a reagent (16). 50 [i\ of various concentrations of the extracts in methanol were added to 5 ml of a 0.004% methanol solution of DPPH-. After a 30 min incubation period at room temperature, the absorbance was read against a blank at 517 nm. Inhibition of free radical DPPH in percent (/%) was calculated in following way: 1% = (Ablank-Asample/Ablank) xlOO; where Ablank is the absorbance of the control reaction (containing all reagents except the test compound), and Asample is the absorbance of the test compound. Extract concentration providing 50% inhibition (ICso) was calculated from the graph plotting inhibition percentage against extract concentration. Tests were carried out in triplicate. In this assay, antioxidant capacity is determined by measuring the inhibition of the volatile organic compounds and the conjugated diene hydroperoxides arising from linoleic acid oxidation (17). A stock solution of b-carotene/linoleic acid mixture was prepared as follows: 0.5 mg (b-carotene was dissolved in 1 ml of chloroform (HPLC grade), and 25 ml linoleic acid and 200 mg Tween 40 were added. Chloroform was completely evaporated using a vacuum evaporator. Then, 100 ml distilled water, saturated with oxygen (30 min 100 ml/min), was added with vigorous shaking; 2.5 ml of this reaction mixture was dispersed into test tubes and 350 ml portions of the extracts prepared at 2 g/1 concentrations were added and the emulsion system was incubated for 48 h at room temperature. The same procedure was repeated with the synthetic antioxidant BHA as a positive control and with a blank. After the incubation period, absorbances of the mixtures were measured at 490 nm. Antioxidative capacities of the extracts were compared with those of BHA and the blank. Total phenolic content and in vitro antioxidant activities by using DPPH and (3-Carotene/linoleic acid assay of methanolic extract from S. aethiopis, S. candidissima, S. limbata, S. microstegia, S. nemorosa, S. pachystachys, S. verticillata, and S. virgata were investigated and results are shown below. Based on the absorbance values of the various extract solutions, reacted with Folin-Ciocalteu reagent and compared with the standard solutions of gallic acid equivalents as described by Slinkard and Singleton (15), results of the colorimetric analysis of total phenolics are given in Table 1. The amount of the total phenolics was highest in Salvia verticillata (167.1 mgGAE/g DW), followed by Salvia virgata (101.2 mgGAE/g DW) and Salvia candidissima (100.3 mgGAE/g DW). Salvia microstegia had the lowest total phenolic content (50.3 mgGAE/g DW). As far as our literature survey could ascertain, several studies have been carried out with the Salvia species and total phenolic content has been found to be between 41-134 mgGAE/g DW basis (18, 19). All these results support our findings. The free radical scavenging activities of the obtained extracts from eight Salvia species are given in Table 1. As can be seen in Table 1, there were statistically important differences among Salvia species in terms of free-radical scavenging capacity. IC50 is the amount of extracts providing 50% inhibition of hydroxyl radicals and values lower than IC50 reflect better protective action of the extracts. The best IC50 values were obtained from Salvia verticillata as 18.3 [ig/ml. The other species that have high free radical-scavenging capacity were Salvia virgata (23 A [ig/ml) and Salvia nemorosa (32.0 \ig/ ml), respectively. The control (BHA) had the lowest radical-scavenging capacity (15.2 [ig/ml) of all Salvia species, but statistically within the same group with Salvia virgata (23 A [ig/ml) (Table 1). Previously, radical scavenging capacity of Salvia species were found to be between 18.00-81.00 |ig/ml in Turkey (19, 20, 21) and 23.53-125.10 mg/ml in Iran (22). All these findings are in accordance with our results. Hydroxyl radical is a biologically relevant and extremely reactive oxygen species, which can rapidly react and degrade with susceptible food and biologically relevant substrates, such as polyunsaturated fatty acids, proteins, carbohydrates and DNA (3). DPPH is a stable free radical and accepts the hydrogen radical to become a stable diamagnetic molecule, yellow coloured diphenylpicrylhydrazine (23). The synthetic nitrogen-centred DPPH is not biologically relevant, but is often used as an indicator compound in testing of hydrogen-donation capacity and thus antioxidant activity. 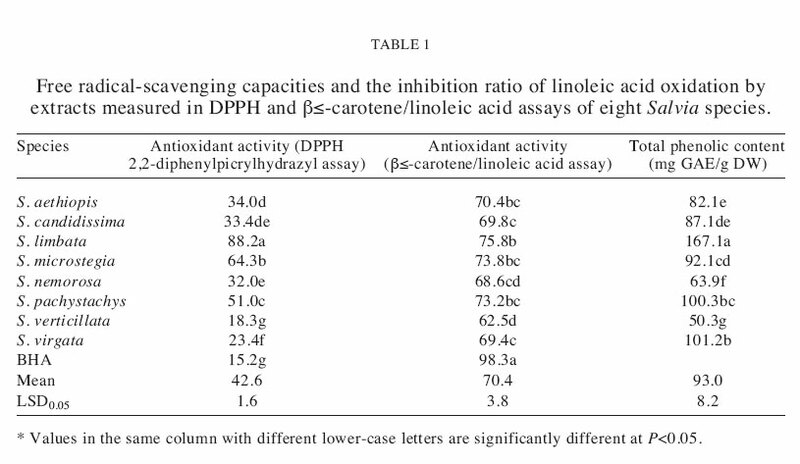 Table 1 shows the antioxidant activity of the 8 Salvia species extracts as measured by the bleaching of b-Carotene. In b-Carotene/ linoleic acid assay, oxidation of linoleic acid was effectively inhibited by Salvia verticillata extract (75.8%), followed by Salvia virgata (73.8%) and Salvia nemorosa (73.2%), respectively (Table 1). The antioxidant activity of synthetic BHA was 98.3% indicating higher values than all Salvia species. Antioxidant activity using b-Carotene/linoleic acid assay of Salvia species has previously been studied and the antioxidant activity were between 29.0 and 69.2% (18,20). b-Carotene undergoes rapid discoloration in the absence of an antioxidant. This is because of the coupled oxidation of P-Carotene and linoleic acid, which generates free radicals. The linoleic acid free radical formed upon the abstraction of a hydrogen atom from one of its diallylic methylene groups, attacks the highly unsaturated b-Carotene molecules. As a result, b-Carotene will be oxidized and broken down in part. Subsequently, the system looses its chromophore and characteristic orange colour, which can be monitored spectrophotometrically. The presence of different antioxidants can hinder b-Carotene bleaching by neutralizing the linoleic-free radical and other free radicals formed in the system (24). 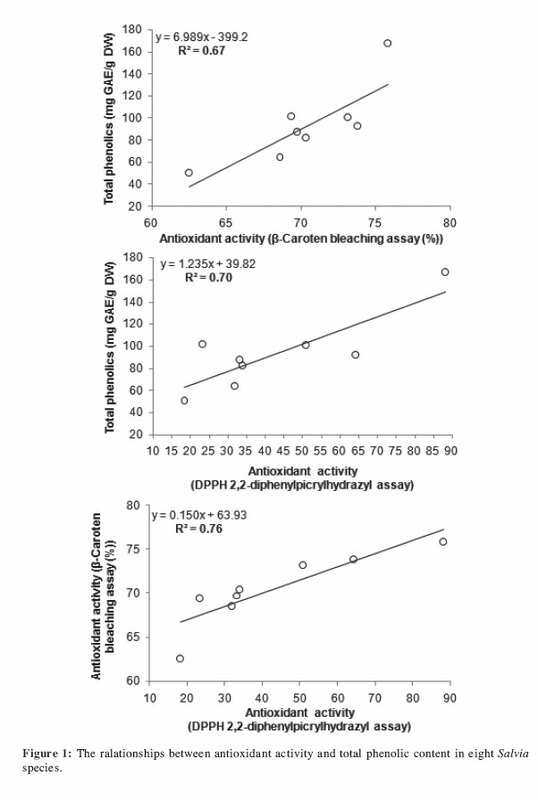 It is extremely important to point out that there is a positive correlation between antioxidant activity and the total phenolic content of the extracts (Figure 1). Phenols are very important plant constituents because of their scavenging ability on free radicals due to their hydroxyl groups (25). Therefore, the phenolic content of plants may contribute directly to their antioxidant action. Plants belonging to the Lamiaceae family are very rich in polyphenolic compounds. The major phenolic compounds identified in the extracts of sage are rosmarinic acid, carnosic acid, salvianolic acid and its derivates carnosol, rosmanol, epirosmanol, rosmadial and methyl carnosate (26, 27, 28). Among these, rosmanol is a major constituent of many Salvia species and has strong antioxidant activities because these groups cause phenols to more easily donate hydrogen atoms to activate free radicals to interrupt the chain reaction of antioxidation (29). The DPPH scavenging capacity of these extracts may be mostly related to their phenolic hydroxyl groups. However, these properties of putative antioxidants have been attributed to various mechanisms, among which are prevention of radical chain initiation, binding of transition metal ions catalysts, decomposition of peroxides, prevention of continued hydrogen abstraction and radical scavenging (30). According to the above, all results were wide diverse on antioxidant activity and phenolic content among Salvia species. It was well known that the occurrence of chemicals in aromatic and medicinal plants, in this case Salvia, is not only an indication of chemical diversity but may also help solve taxonomical problems. These chemicals have also attributed to have antioxidant activity. The antioxidant and chemical diversity is mostly illustrated with examples from genera such as Sideritis, Salvia, Thymus, Origanum, Satureja, Thymbra, Mentha, Micromeria, Ziziphora, Calamintha, Cyclotrichium, Acinos, Echinophora, Ferulago, Heracleum, Pimpinella, Tanacetum, and Betula. (31). Previously it was reported that S. aethiopis is rich in terms of oxygenated monoterpenes, S. candidissima and S. verticillata are rich in sesquiterpene hydrocarbons and S. microstegia is rich in oxygenated sesquiterpenes (18, 31). Therefore this difference is based on genetic derrivates of the species used. The phenolic and antioxidant diversity has been previously reported in many plants, such as persimmon (32), sea buckthorn (33) etc. In conclusion, the methanolic extract of eight Salvia species exhibited different levels of antioxidant activity in all the models studied. The results from DPPH, free radical-scavenging system revealed that the Salvia had significant antioxidant and free radical-scavenging activity. The free radical-scavenging property may be one of the mechanisms by which these plants, notably Salvia verticillata and Salvia virgata, can be used as natural antioxidants.